Piriou’s yard in Vietnam is currently assembling a pair of aluminium offshore wind farm support vessels for UK operator Wind Energy Marine. 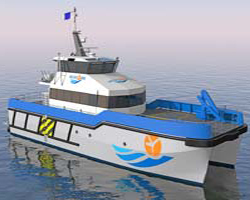 Developed to the specs of BMT Nigel Gee’s WFSV 26W design, the duo will be classed by Bureau Veritas, compliant with UK Maritime & Coastguard Agency (MCA) Cat 1 requirements and certified under the UK’s recently adopted High Speed – Offshore Service Craft (HS-OSC) Code, thus enabling each vessel’s three-man crew to potentially carry up to 24 wind turbine technicians, now that these personnel are no longer referred to as ‘passengers’. This interim code, which applies to boats under 500tonnes, is similar to the existing HSC Code, albeit with a number of passenger-related relaxations in recognition of the fact that the average offshore worker undergoes far more relevant marine safety training than the typical ferry passenger. Under the HS-OSC Code, support vessels smaller than 24m are permitted to carry up to 36 personnel, while larger boats can carry up to 60 persons. Each of the newbuilds at Piriou Vietnam will measure 27.5m x 8m and feature a maximum draught of 1.25m. One of the key design features has been to optimise deck space, and each vessel subsequently has a cargo capacity of 20tonnes, with the space to accommodate three 10ft containers. Each boat’s fore deck will also be equipped with a crane, rated 8.5tonnes. Accompanying these increases in cargo capacity and vessel length, each craft will be capable of storing up to 25,000litres of fuel. Each will also incorporate twin waterjets, helping to generate a top speed of 27.5knots, and will have a range of 150nm from the nearest safe haven. The wheelhouse has been resiliently mounted, for reduced noise and vibrations and enhanced crew comfort. Delivery of the pair is scheduled for spring 2018, after which they will enter service in the North Sea. The CTV market is proving a profitable one for Piriou: just weeks before the Wind Energy Marine order was secured, Piriou Vietnam delivered a 42m x 8.2m fast personnel and supply vessel (FPSV) to Saudi Arabia’s Jana Marine.This triple-screw, aluminium model was built to weather tasks such as rig crew transfer, in-field support and prompt transportation of supplies, and featured the ability to carry 10 crew, 80 offshore workers and up to 50tonnes of cargo at speeds of up to 25knots.